James Christensen, age 71, died May 3. 1995 in , Edmond, OK. He was born July 24, 1923 in Chicago. IL. to Jens and Meta Christensen. He married Jacquelyn Preble on March 29. 1946 in J Chicago, IL. He was an accountant tor Edward-Gray Corp. In Chicago. He moved to Edmond six years ago from Chicago. He enjoyed gardening and reading. He is survived by his wife, Jacquelyn of The Home; one daughter, Jacquelyn Rohan and husband, Timothy of Edmond and one sister, Delsle Thompson of Chicago, IL. He was preceded In death by his parents; one son, James Thomas and one grandson, James Timothy. Services will be Friday, May 5, 1995 at 11 a.m. at Baggerley Funeral Home Chapel in Edmond. Memorial contributions may be made to the Edmond Guthrie Hospice or the salvation Army. 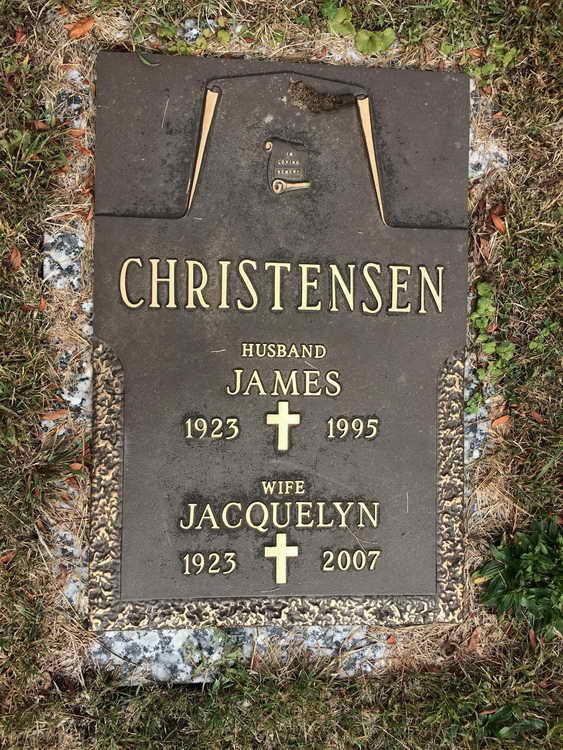 Grave marker for James and Jacquelyn Christensen in Evergreen Cemetery and Mausoleum, Evergreen Park (Cook county), Illinois. James enlisted in the Army at Chicago, IL on 9 November 1942 and was assigned to Company D, 508th PIR. On June 30, 1943 he was appointed to the grade of Pfc and on 17 July he was appointed to T/5. T/5 Christensen was initially listed as MIA on 6 June 1944 bur on 27 June 1944 his status was updated to show he was in the 40th General Hospital having been slightly wounded in action on 8 June 1944. He was sent back to Company D but immediately transferred to Service Company for light duty and further recuperation. T/5 Christensen was promoted to T/4 on 1 November 1944. T/4 Christensen was wounded i action in Belgium on 26 December 1944 and evacuated. His wounds were more severe this time and he was transferred to the Parachute Replacement Regiment, Parachute School, Fort Benning, GA for further treatment. He was discharged on 11 May 1945. On 25 March 1945 he married Jacquelyn Preble in Cook County, IL. It is she who shares this grave site with him. His military decorations include the Purple Heart with one Oak Leaf Cluster.